The ‘informatics landscape’ has existed for centuries in card indexes and for decades in computer databases across the globe. 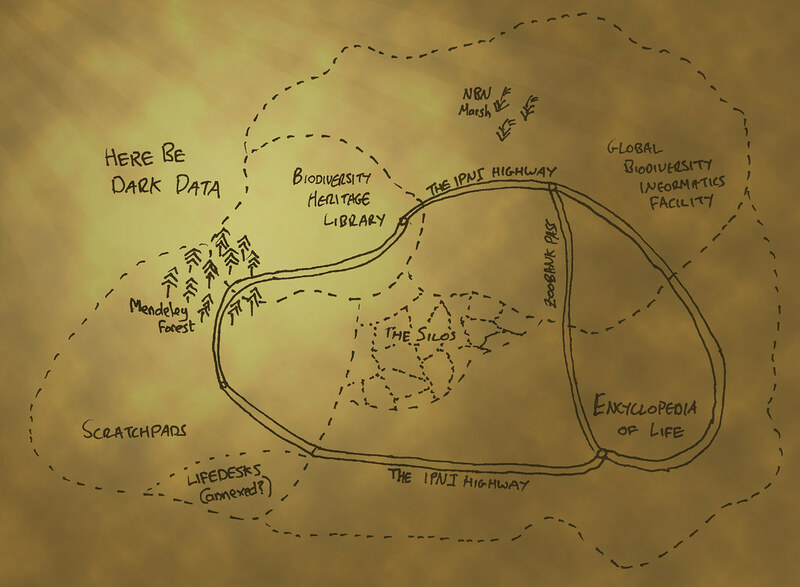 These datasets were highly fragmented, geographically distant, hard to access and had no common data models. The 21st century has seen a number of projects try to aggregate information about biodiversity - allowing different datasets to be standardised, integrated and searched as one. The Global Biodiversity Informatics Facility (GBIF) does this for specimen and observation data, the Biodiversity Heritage Library aims to digitise historic literature, the Encyclopedia of Life is a portal into these data for non specialists and Scratchpads provide a tool for doing biodiversity research online. The combined size of these datasets is impressive, and growing significantly. In order for them to be useful we must understand what species each item relates to. This seemingly trivial task is complicated by the the same organism have multiple names (synonyms) or by the same name being applied to multiple species (homonymy). To resolve these issues nomenclatural databases are being constructed (e.g. ZooBank for animals, International Plant Names Index for plants) that when properly integrated into the landscape will allow people to find all of the information about a species, no matter what name was used in the search term or the original work. Alongside these core features (specimens, observations, literature, communication) of the landscape there is a whole ecosystem of other projects that people use to contribute data to the big projects (e.g. NBN Gateway) or analyse the data they contain (OBOE). This category also contains bibliographic tools such as Mendeley, dissemination tools such as Wikipedia, and the user-generated documentation, experience, advice and frustrations spread across blogs, Twitter and other social networking sites. Scratchpads allow you to combine your data with information from EoL, GBIF and other partners. You can also share your data if you choose to with EoL, GBIF and any other project that accepts DarwinCore Archives, or perform analyses of your data using OBOE. We also make use of services from ZooBank, IPNI and others to make our tools more useful for our users.